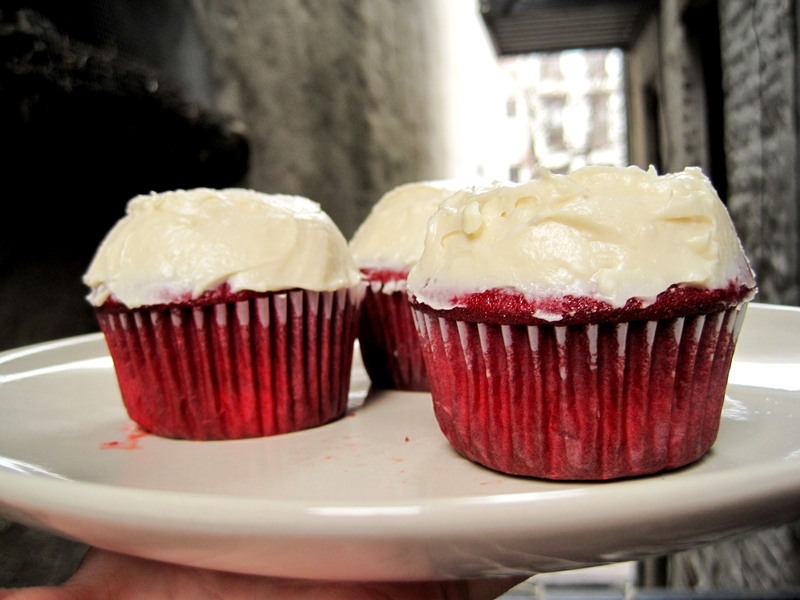 After having a red velvet cupcake from Two Little Red Hens, my hankering for red velvet cupcakes was insatiable. It’s unfortunate how far away Two Little Red Hens is from my apartment, so it’s a rare treat that I have maybe a couple of times a year. 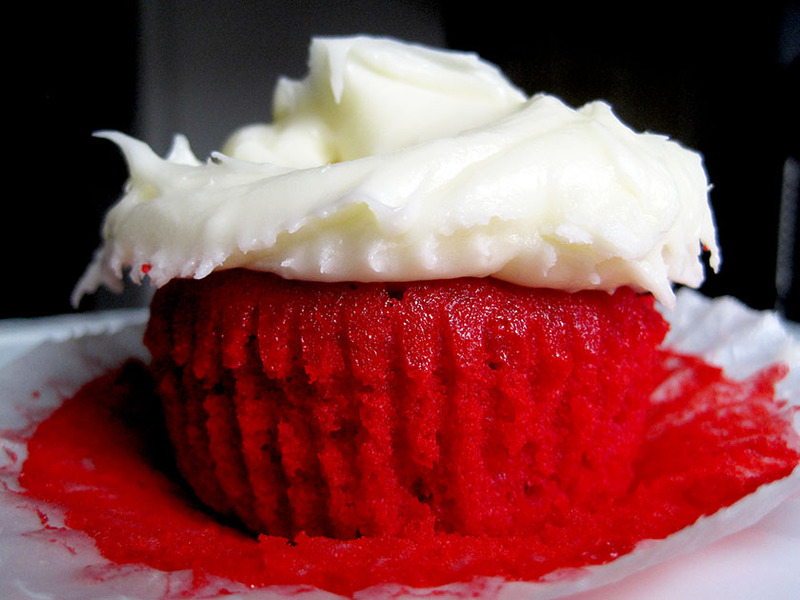 I was desiring a red velvet cupcake up till a week after I had my first bite and had to quell the thirst immediately. For some inane reason there are no decent red velvet cupcakes within a ten block radius of my apartment. Making these cupcakes was also a bit of a triumph for me. My left hand had been bit by a dog in the last month, and the fracture I sustained with the inflexibility rendered by the deep scars meant I was still struggling to hold onto things with my hand, or carry heavy things. These cupcakes are moist, and almost too oily for me. I think I had rather high standards after having a light and fluffy Two Little Red Hens cupcake, but well, I also don’t run a bakery. 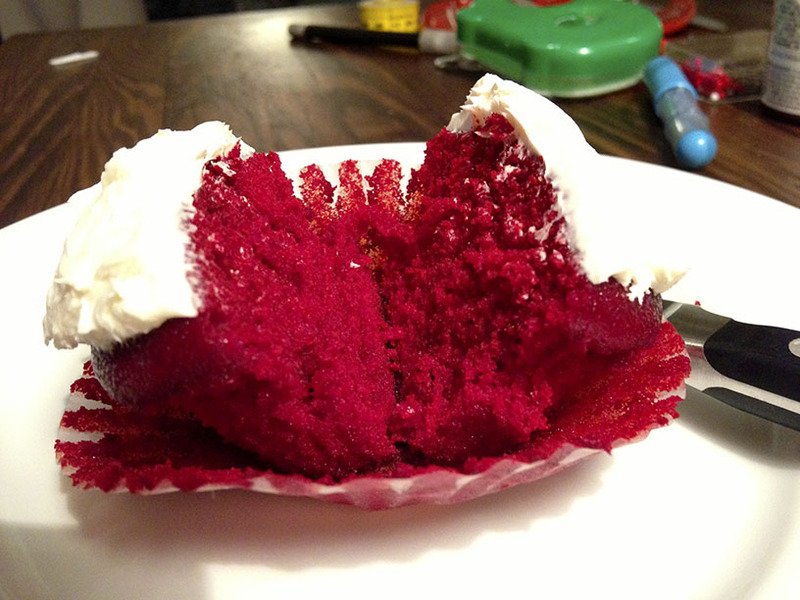 Other than that, the cupcake had a distinct red velvet taste – a balance between being tangy and cocoa-y. The frosting is creamy and delicious – I would suggest making sure it’s 100% lump-free before applying it onto your cupcake. I’d say these cupcakes aren’t deathly sweet and actually have a decent balance of flavor. I thought the batter was top-notch when I was licking it off the bowl, mmm. Sift together flour, baking soda, salt, and cocoa powder into a bowl and set aside. With an electric mixer, beat oil, sugar, and buttermilk until combined. Add eggs, food coloring, vinegar, vanilla and water and mix well. Add the dry ingredients a little bit at a time and mix by hand until well mixed. Be sure not to overmix, or the batter will come out tough. Line 14 cupcake cups with paper liners, scoop the batter into the liners dividing evenly (a little over halfway full) and bake at 350 degrees F for 20 minutes or until the toothpick comes out clean. Let cool. Whip the butter and cream cheese together in a mixer fitted with a paddle attachment until creamed. Gradually add powdered sugar to the mixture and scrape down the bowl as needed. Add the vanilla and mix until combined. I started my first real job out of college about a month ago, and now that a considerable chunk of my time is devoted to work, I have much less time to blog. I still cook and bake quite often – I recently made two chocolate cakes and a soy sauce chicken, but not having daylight to snap my food in makes blogging an afterthought. 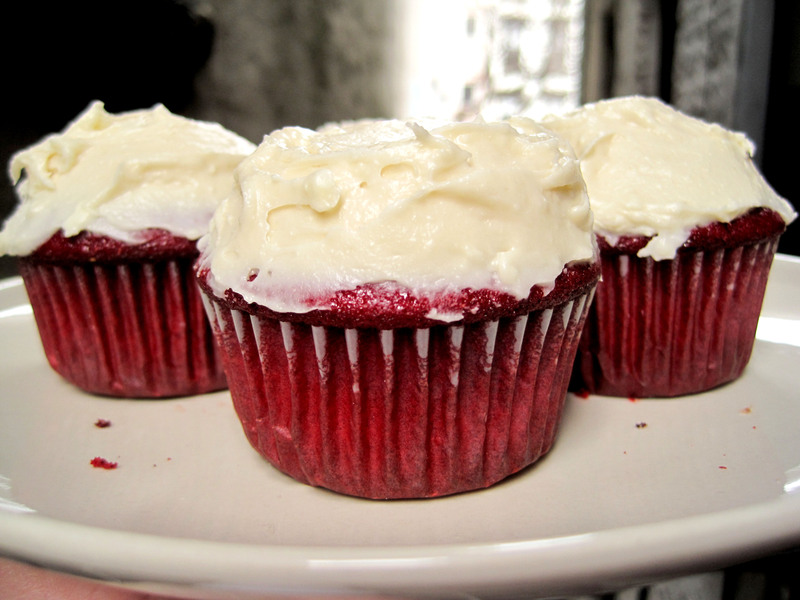 These red velvet cupcakes, however, were for a specific occasion. Every month, my work place hosts a birthday party for people born in that month. I wanted, nay, needed an excuse to bake up something more elaborate than a utilitarian chocolate cake that fulfilled my dessert cravings. The original recipe for these were for an 8-inch layer cake, but for ease of transport, I decided to make them into cupcakes. I’ve made the cake a few days ahead in time and froze them, and I intend to frost them in the office pantry. Transporting frosted cupcakes often require large, bulky carriers, and as a bike rider, I prefer to fit everything into my backpack as much as possible. I used all-purpose flour instead of cake flour for the cupcakes, and that contributed to a slightly coarser but more firm texture that’s transportation-friendly. I baked up about 18 cupcakes with the batter, and I would recommend checking for doneness at around 15 minutes and swapping the racks at half-time. Also, I cannot stress how important it is to sift your flour and confectioner’s sugar before mixing. It’ll help create a more uniform texture with less lumps and clumps. Preheat oven to 350 degrees F. Line 18 (or potentially more) cupcake moulds with cupcake liners. In a small cup, combine the soda and the vinegar and let it foam up. Pour the foaming mixture into the batter and stir until it’s mixed in. Immediately pour into the cupcake liners and bake for 15-20 minutes. 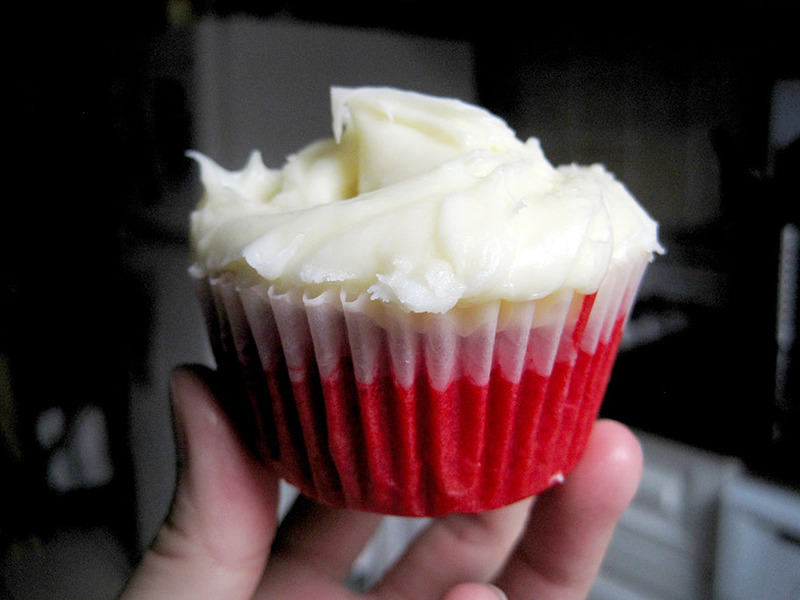 When a toothpick inserted into the center of a cupcake emerges without crumbs, it is done. Let cool for 10 minutes in pan set on a rack. Remove from pan and let cool completely. Make icing. I thought the cake was very good. It was moist and chocolatey. 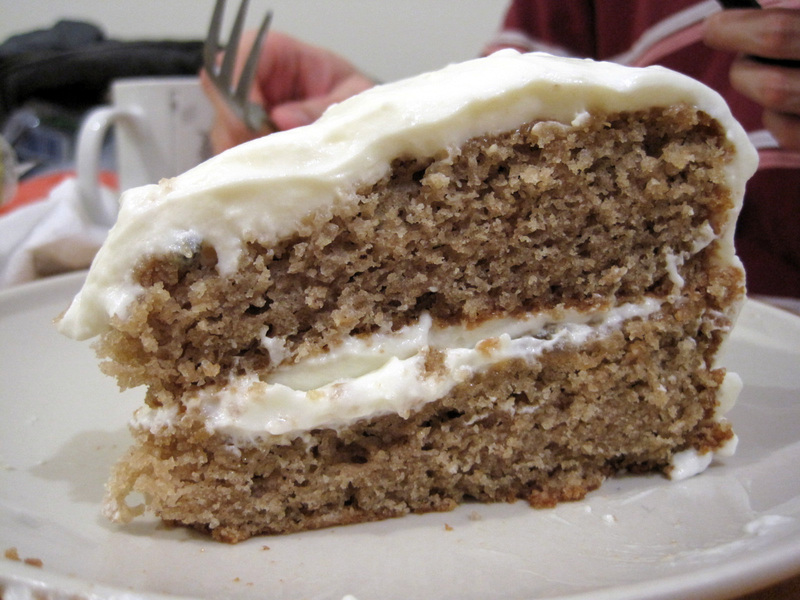 It’s a denser sort of cake, but I liked it. 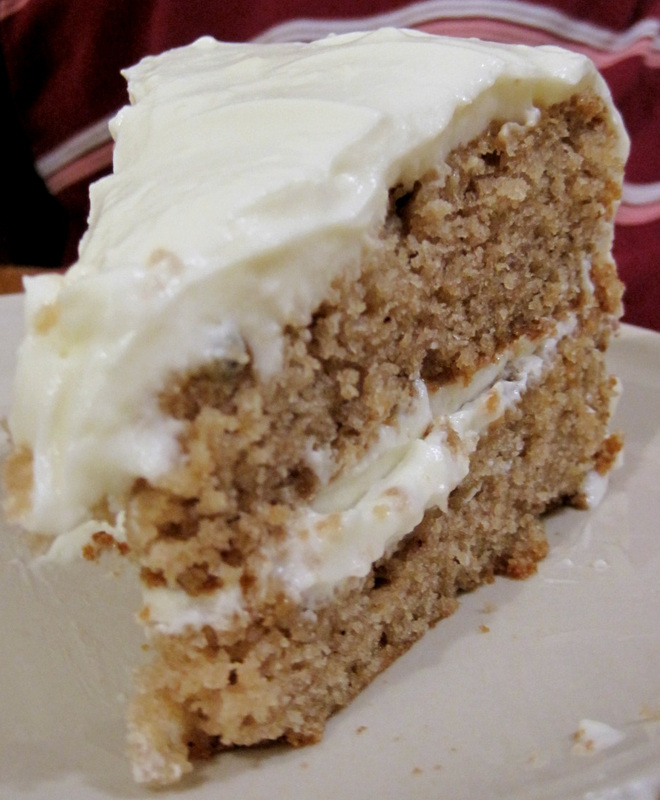 I think adding substituting chocolate frosting for butter upped the chocolate flavor and also made for a sweeter cake. The chocolate frosting was crap by itself, though. I think it’s because I used natural cocoa powder as opposed to Dutch-processed cocoa powder. Dutch-processed cocoa powder has been processed to neutralize the acids in it, and has a more delicate taste. 1. Preheat oven to 350 degrees F, or 325 F if using black cake pans. 2. Line a 9 inch round pan with parchment and grease the sides. 3. Combine water and cocoa in a bowl and stir until smooth. Reserve. 4. Mix together dry ingredients. Reserve. 5. In large bowl of an electric mixer, cream butter and sugars. 6. Beat in eggs and vanilla. Stir buttermilk into cocoa mixture. 7. Add alternately with dry ingredients in 3 additions. 9. Bake 28-38 minutes or until a toothpick comes out barely clean. Cool and frost. I used a light-colored pan and mine took 30 minutes. I let my cake cool in the pan for about 20 minutes, and when I removed it, it was still warm but it stayed intact. Makes way too much. I halved the original recipe; I recommend halving it again. 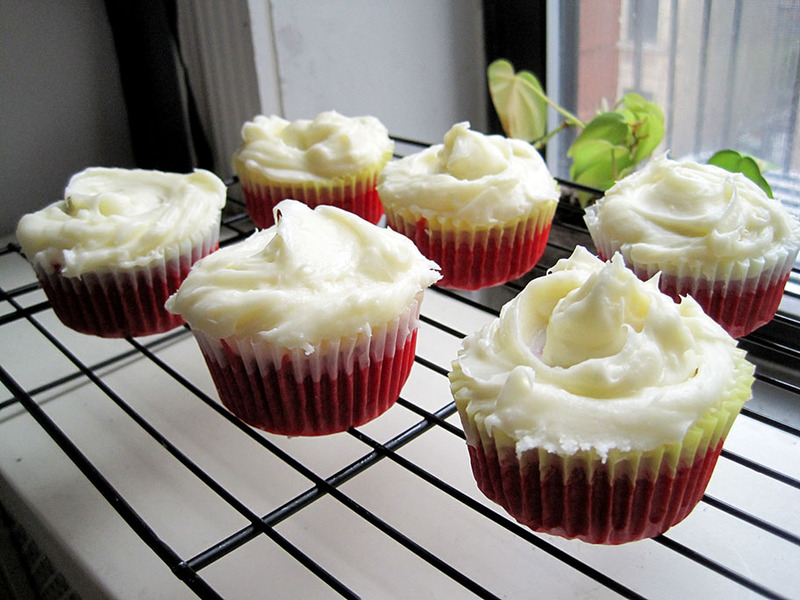 Frosting can be refrigerated up to 5 days, or frozen up to 1 month in an air tight container. Before using, bring to room temperature and beat on low speed until smooth again. The recipe for these cupcakes are from Magnolia Bakery. I didn’t like them too much, though. The cheesecake filling wasn’t very sweet and neither was the cake. However, the cupcake was much improved upon chilling. 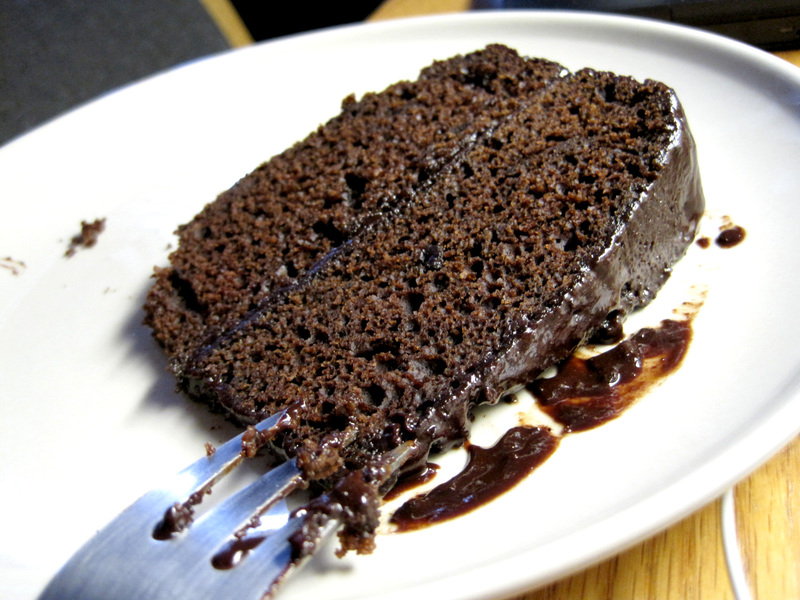 The cake took on a brownie-like texture, and the cheesecake filling felt smooth and velvety. Preheat oven to 350 degrees F. Line cupcake pan with 9 paper cups. In a stand mixer, beat the cold cream cheese until fairly smooth. Add the sugar and beat until smooth. Add the egg and beat until incorporated. Stir in the chocolate chips and set aside. Combine the flour, cocoa, baking soda and salt; mix well set aside. In a mixing bowl, beat together the vegetable oil and sugar – I did this with a hand-held electric mixer, but a whisk would probably be fine. The mixture was kind of thick and grainy and didn’t hold a lot of air. 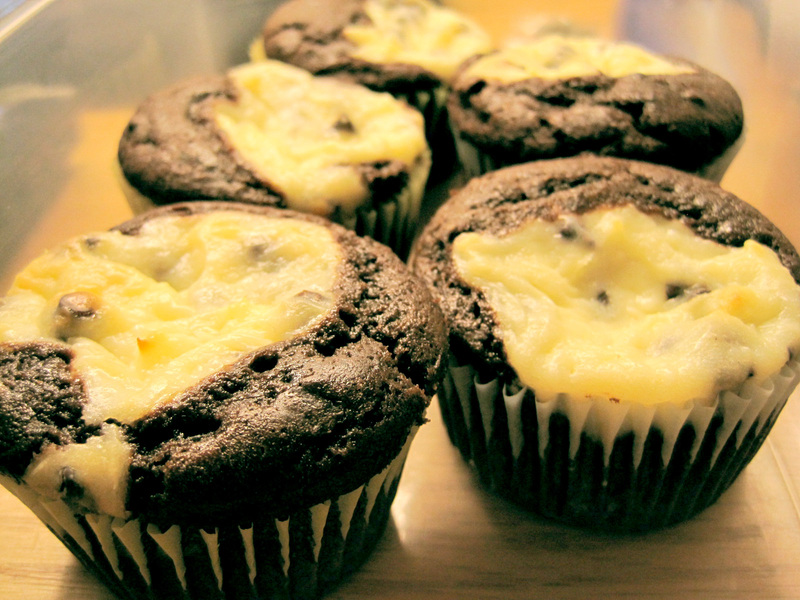 Divide the chocolate batter evenly among the muffins tins and top with a dollop of the cream cheese mixture.